The final episode before the Fastlane PPV proved a pretty exciting one as the WWE universe was treated with some flying action and emotional burst downs. The night featured a lot of ups and downs but mostly ups as the people of Philadephia got to see a great show right before their eyes. The WWE creative has been on their toes in order to get the fans exhilarated for the grandest stage of them all. Fastlane is the final stop before WrestleMania 35 and the company gave us a lot to discuss. #5 Triple H vs Batista is Personal! When Batista’s return was being predicted months ago, not a single fan would’ve anticipated what happened last week on Raw. The animal unleashed his wrath on the nature boy last Monday night, a night which was truly special for Ric Flair with the world tuning in to celebrate his birthday. 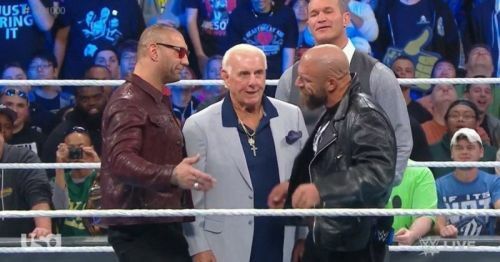 The event unfolded in a rather shocking way with the whole roster out, legends like Shawn Michaels, Kurt Angle, Sting and Ricky Steamboat in the ring to celebrate Ric's 70th birthday and just when the nature boy was supposed to show up, came Dave Batista and attacked him in the locker room. The animal dragged a 16-time world champion and showed disrespect to the company, to Ric Flair and most importantly to the COO of the company, Triple H.
Ric Flair as the world knows is someone Triple H has the utmost respect for and as Batista asked for Triple h’s attention, the game obliged with fury in his eyes and revenge on his mind. WWE might have not made it official but the world knows as of know that Batista vs Triple H is happening at Wrestlemania 35. 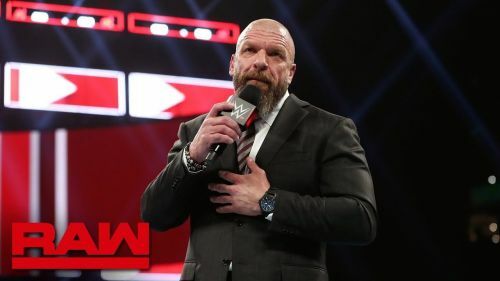 If anything could be drawn from Triple h’s emotional segment on Raw then one thing is clear that this bout no more just for business and the game is coming for Batista.